Although businesses come in all different shapes and sizes, the size of your team doesn’t define the magnitude of your social media presence. Competition has recently heightened between Instagram, Snapchat, and Facebook, with the companies constantly releasing new updates and mirroring each other’s features. This has created a sense of pressure for businesses to be as creative and tech-savvy as they possibly can. However, the strategies used in your posts are much more important to their level of engagement than the size of your company or the genius of your marketing employees. Check out these social media tips to improve your business that you might be missing out on! Having a tough time remembering to post a new article, celebrate your company’s one year anniversary, or recognize National Hot Dog Day in 140 characters or less? You can be sure to never miss out on sharing an important Tweet by composing them in advance and scheduling their post time. If you come across Twitter inspiration for a later date, jot it down in a website app such as Hootsuite. Not only does this save you the time and energy of posting on Twitter all in one shot, but it also allows you to collaborate new ideas with your team and choose the optimal posting time for your business. As of this month, Snapchat released a new Paperclip feature that gives users the ability to attach links to their stories. This is a great opportunity for businesses to direct users right to their websites, landing pages, blog posts, or pages with more information about a particular service. By toggling your stories to run on a loop (rather than 10 seconds max), you can increase user interaction with your posts. Check out this article to watch a demo about posting links in Snapchat stories, as well as to learn more about the app’s new features. Let people check in to your business page by going to your “About Tab” in Facebook, pressing “Edit Page Info,” and making sure to check off the box below the map to ensure that the option to check in appears on your page. When a Facebook user takes advantage of this feature, they’re showing their friends that they visited your business or are enjoying your service. This is an easy way to advertise your company online while simultaneously increasing your engagement for free. Although it can be time-consuming to create your own images, taking advantage of photo editing apps can be a great way to make your photos pop on your different social media sites. According to Webdam, posts with images receive 650% more engagement than posts with only text. To make sure that your images are clear, eye-catching, and are creating a consistent “look” for your company, check out our previous blog post that dives into the details of 5 of the best photo editing apps. If you haven’t already, try switching your Instagram account to a business profile to view the analytics of your account. This feature provides information about the age range, gender, and frequent locations of your followers so you can learn the best ways to tailor your posts to your audience. In addition, Instagram Insights show your top posts right on the app, so you don’t have to go to a third-party site to analyze how users have been liking your content. With this tool, you can easily become the expert on your followers’ taste and activity on Instagram to improve the reach of your posts. Stories last for only 24 hours, making them temporary, but the long-lasting effect they can have on your business isn’t. Take advantage of these features and make your company seem more personal by showing users the behind-the-scenes of your typical work day or something new that you’ve been working on. You can add your location, text, or filters to grab the attention of users and increase the number of views per posts. If you’re feeling generous, try offering a special deal on your service to those who reply to your story to increase the engagement with your post and your potential to reach new clients. Post hashtags that are trending, related to your business, or simply creative on all of your social media posts. When used often- but not in excess per post- hashtags can allow you to connect with your current audience and grow your network. You can maintain your branding by using some of the same hashtags consistently, but also should switch up your hashtags to stay up-to-date with the trends and maintain the interest of your users. This helps to engage your followers while simultaneously building your company’s relationship with them. 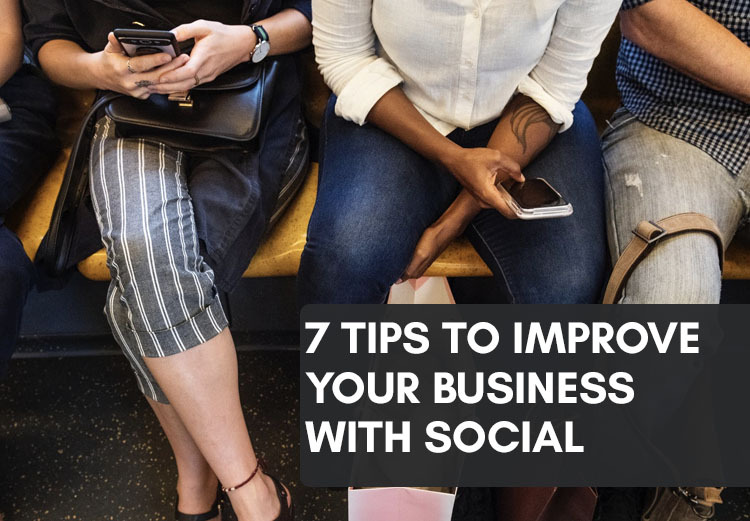 Whether you’re just getting started with your company’s social media accounts or already have built up a good following, there are always ways to improve your content and gain a greater presence. And remember: social media is there to generate leads for you, but it won’t convert them for you too. Stay on top of how you manage your leads, get excited for the launch of our CRM (coming soon! ), and let us know how these tips work for you!